Za-Za-Zingerman’s – A devine dinner with dear friends! Friday’s outing started long ago with a Facebook message from a friend of mine – someone I met during my first job out of college. 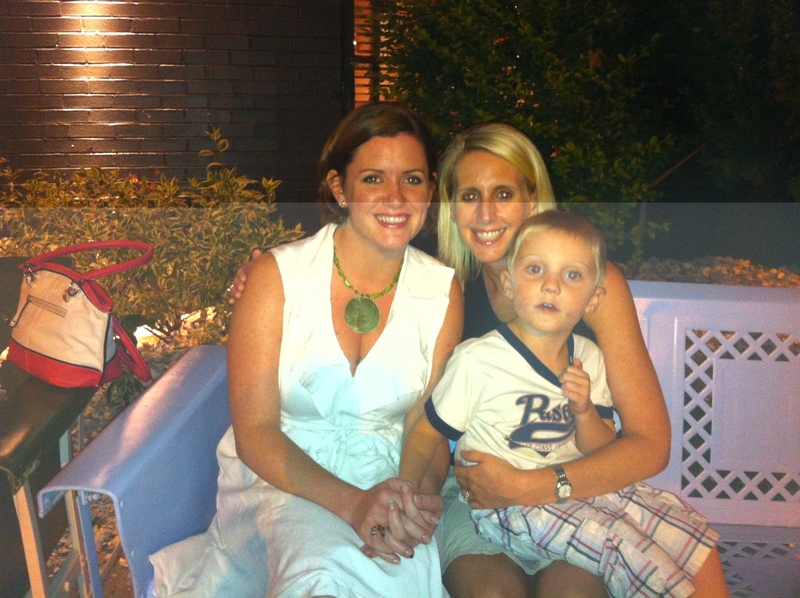 A friend I love as much now as I did then – the same is true for her husband! Her message came in January of this year, and I marked my calendar, but then…months passed, and it may have (allegedly) slipped my mind. Allegedly! No harm, no foul. I was supposed to have another friend come into town this weekend, and I thought it would be fun to introduce these friends to each other. My friends tend to get along, even without knowing each other well. But, plans changed, and I suddenly found myself without a house-guest and free to make plans as I chose. Since my friends, Scott and Julie, were coming from Cincinnati, OH through Ann Arbor, and heading “up north”, as Michiganders say, it made sense for me to meet them in Ann Arbor. And, I was glad to have a reason to head to A2 again. The last couple of times I’d been there were for sporting events…the “Big Chill” (MSU at UofM hockey) and the first UofM game under the lights (against Notre Dame). GREAT reasons to be there, but not super conducive to really getting a feel for the city on a “normal” night. An important note: Masco’s CEO, Tim Wadhams, is a former DB for UofM football, and he and I bonded over our mutual love for our collegiate football programs (mine being Clemson, if you somehow (how could you have?!?) missed that) long ago. He’s also still actively involved in the UofM and Ann Arbor communities. So, when I was looking to go to Ann Arbor with friends, I didn’t hesitate to ask him for a recommendation. And, he gladly obliged. 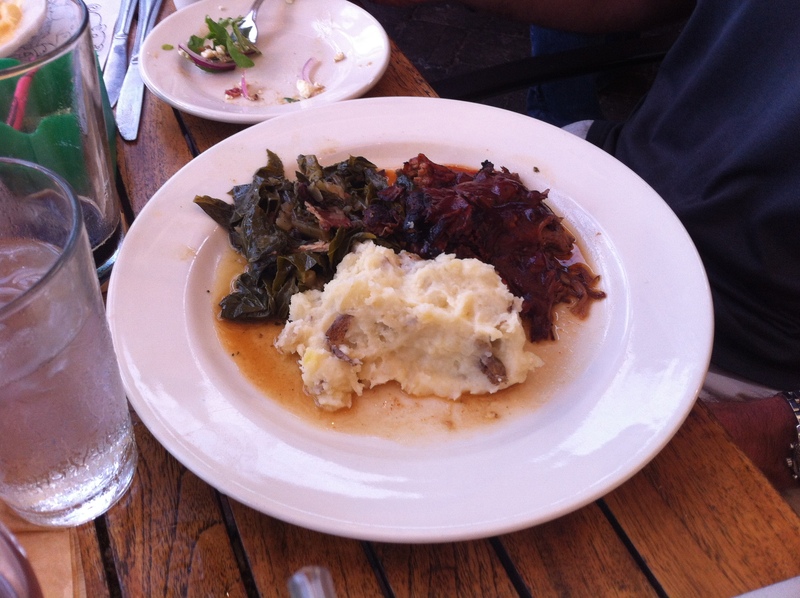 Tim gave me a few options, but his highest recommendation was Zingerman’s Roadhouse on Jackson Ave. So, our plans were set. I drove to Ann Arbor (35 min or so – a ride I should take more frequently! ), chatted with my friends for a bit, and then we headed up the road to Zingerman’s. And, when we received our paper menus wrapped in their newsletter, I was overwhelmed by the number of choices. I had read in a recent Detroit Moxie blog post that Zingerman’s has great Mac ‘n Cheese, so I thought I might go for that…but then there is an entire section dedicated to Mac ‘n Cheese! So…our server was going to carry the burden of choosing for me. Chris was the lucky one that night! He came by to take our drink orders. Julie ordered a glass of Chardonnay, Scott ordered a beer ( a Stout that featured Michigan fudge as an ingredient! ), and I declared that I’d have Chris order my entire meal and that I’d like a glass of wine that would compliment his choice. Chris didn’t flinch, and simply politely asked if I had any restrictions (I hadn’t given him my card). 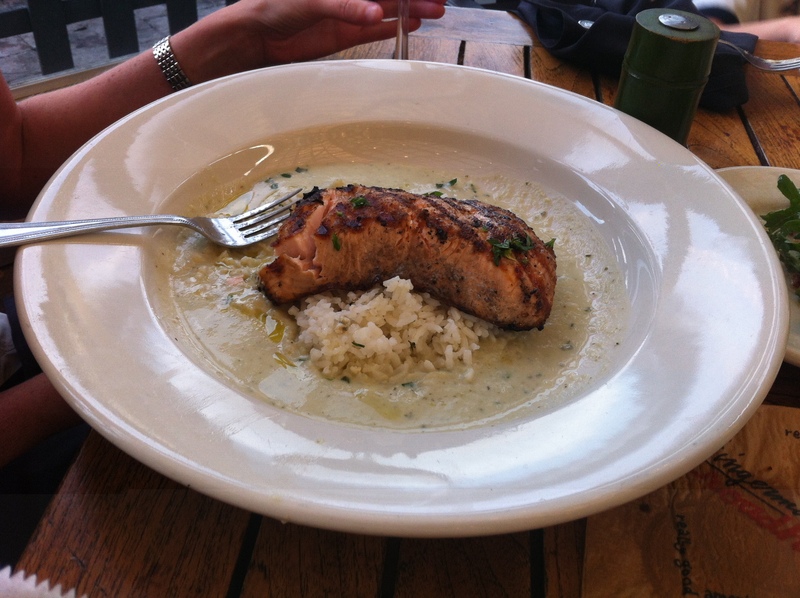 He said he knew what he’d order for me – if – IF, they hadn’t run out! A good sign. 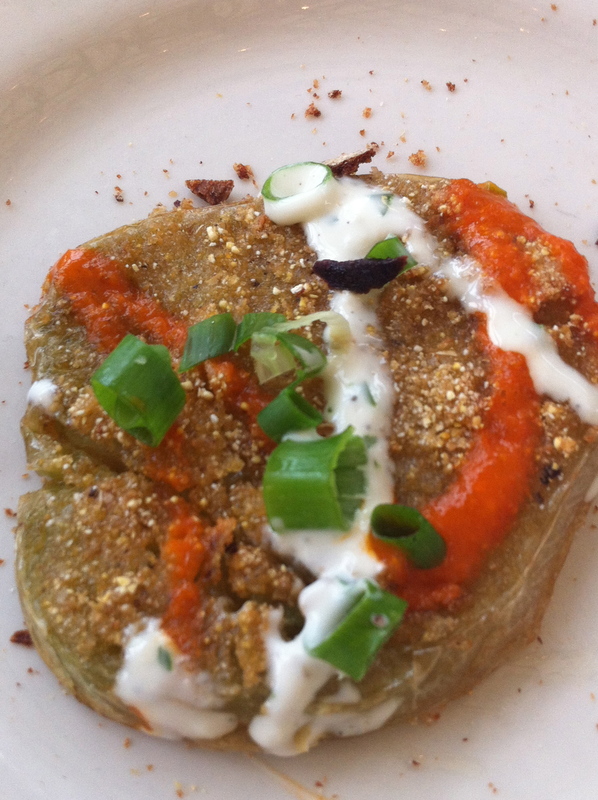 We also ordered the Cornman’s Farms‘ Fried Green Tomatoes (amongst the best I’ve had – with hot sauce and ranch drizzled over them) as an appetizer. After he had delivered each of our drinks (initially serving Ben, 4, Scott’s beer rather than the milk that was ordered for him! 😉 ), Chris asked if I would like to know what he had chosen. Of course I would! Chris is one of those servers I love encountering…he knows his stuff! He advised me that he chose a Cab-Franc for me (Beaucanon), providing a detailed and accurate description. 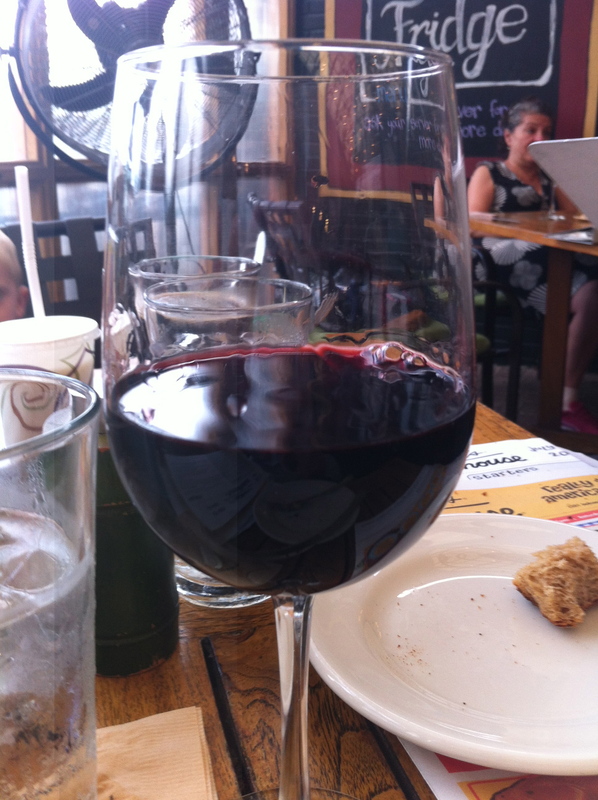 A very nice choice – and a varietal blend I quite enjoy. He also, very astutely, asked if he should place an order for Ben while we adults enjoyed conversation. And then came back later to take our, well, Scott and Julie’s dinner orders. It’s clear that this establishment knows how to cater to their customers! After Scott and Jules split a Bacon and Blue Cheese salad, our dinners were delivered. The “Dexter Black and Blue” had been placed in front of me, Julie did a semi “She Ordered What?! ?” by asking for Chris’s favorite seafood recommendation (Grilled Salmon and Chilled Cucumber Soup), and Scott had the BBQ Pork entree, with collard greens and smashed potatoes (skins still on them – yum!). For the record, Ben had already been digging into his homemade Mac ‘n Cheese. Chris explained to me that he chose this particular dish, which featured three types of heirloom tomatoes, peppercorn rubbed bacon, and bleu cheese in a stew, of sorts. As has happened many times before, I admit that this is a dish I probably would not have chosen from this expansive list of options…but I’m REALLY glad Chris chose it for me. I gave bites to Julie and Scott, and they both agreed – so fresh and flavorful. And, per Chris’s recommendation, soaking up the sauce with Zingerman’s bread was a grand idea! YUM! 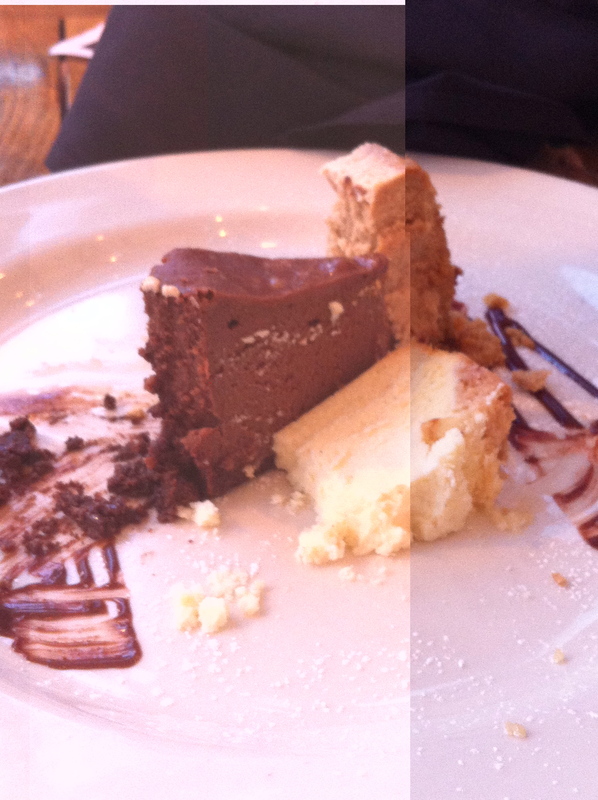 Cheesecake trio – we dug in before I thought to take a picture! We shared a cheesecake trio – NY style, chocolate, and Muscavado (raw brown sugar – a true delight, IMO <– Jules, NOT a fan!). Now…please note that Julie is a SNOB with respect to dessert…if it’s not chocolate…it’s not worth even reading about, let alone eating! So, she enjoyed the chocolate slice (w/each of use stealing a bite here and there), while Scott, Ben, and I enjoyed the other slices. All in all, it was one of the most enjoyable experiences I’ve had in quite some time. The location, the Zingerman’s team, the food, the company, etc…all truly exceptional. And, here is the cute to-go bag they provide. The attention to detail was fantastic, from the way they packaged leftovers (everything separately) – to the way Chris chased Julie down in the parking lot to make sure she didn’t forget her leftovers (literally, her last bite! It made us chuckle that Chris even bothered to package it). I’m so glad that I asked Tim for a recommendation, that he didn’t hesitate to provide one, and that we had such a delightful experience! My only complaint: Chris took my debit card when I handed it to him, and then accepted Scott’s card and allowed him to pay for dinner. People…these were my friends who were MY guests for dinner…he should have allowed me to pay. After all…the card does advise him that “I tip well”. But, I guess I’ll have to forgive him. 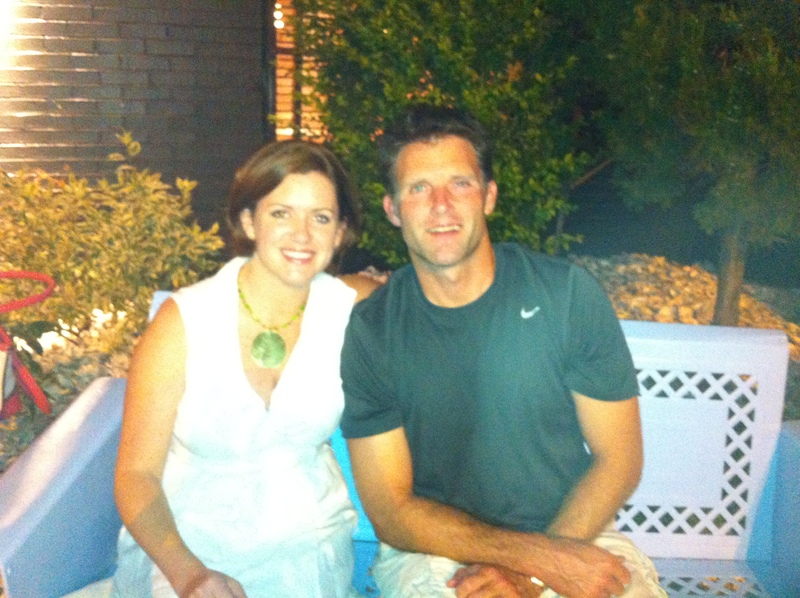 And, I thank my friends Scott and Julie for a wonderful dinner and a great night out! Another important fact: Please also note that Zingerman’s has a sustainable farm at which they grow their own produce and livestock. Everything is extremely fresh, and obviously, the ingredients are controlled. I really love that restaurants are procuring more and more locally – this being an extreme (but a good one!). 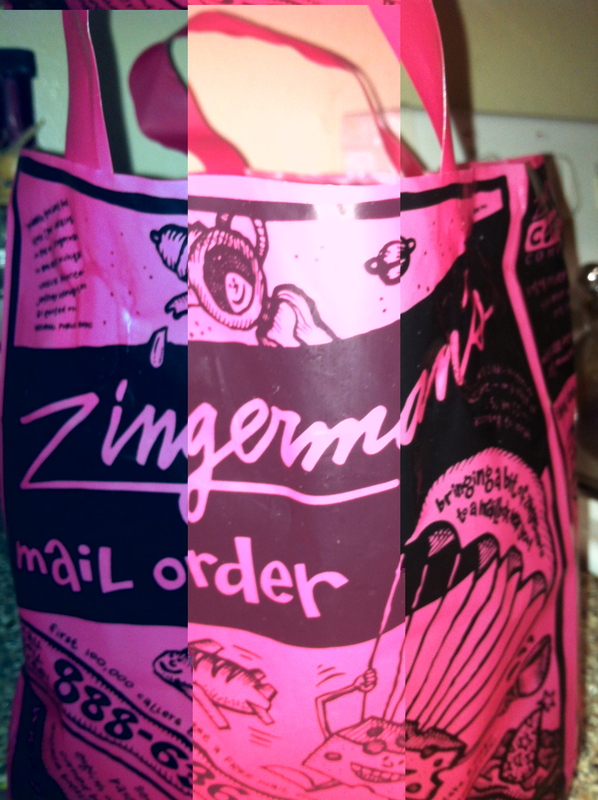 I encourage anyone in the area to give Zingerman’s a try! Within an hour of me publishing the latest post, Zingerman’s staff replied via Facebook, with this response: Thanks for the great review! The trailer is the Roadshow, Ann Arbor’s hippest drive up coffee counter. We serve Zingerman’s coffee, Bakehouse breads and pastries, and it is the pick up counter for all our to-gos. It also has it’s own sandwich menu. Check it out next time you make the drive to Ann Arbor! Hooray & thank you! I work at the Roadhouse. I’m going to make sure Chris sees this. 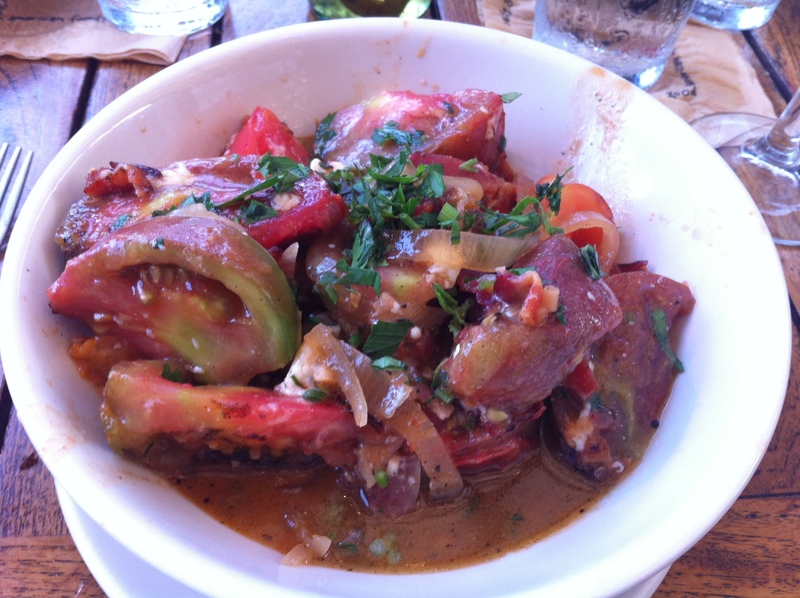 I have to add that I LOVE the Dexter Black & Blue…or anything that includes heirloom tomatoes from our farm. I have a favorite mac & cheese, but I’ll keep it to myself in hopes you ask me to order your entree one of these days.